Drum Wrap Review: Bum Wrap Drum Co.
For our Itsy-Bitsy, Teenie-Weeny DIY Micro Bop Kit, we decided on wrap from Bum Wrap Drum Co. What better opportunity to feature a review for said wrap? If you happen to be a regular visitor to our website, you’ve probably noticed that we’re more prone to come up with alternatives to regular, commercially available wraps. 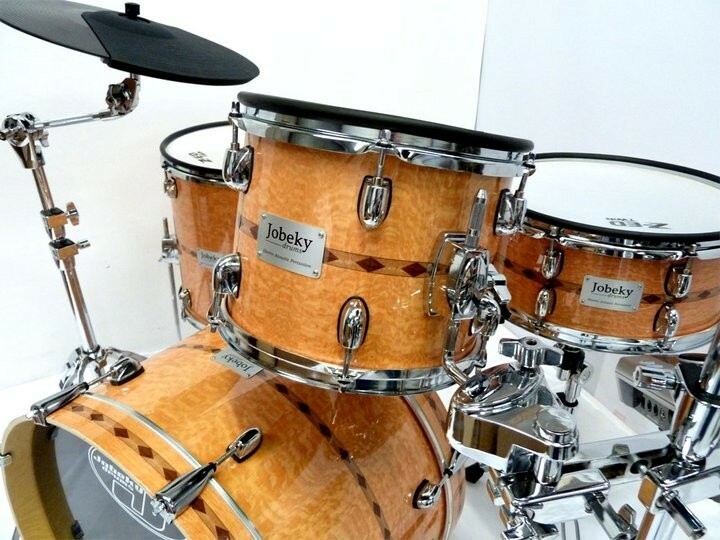 Truth be told, just about every time we start a new project, we evaluate all finish options and the usual reasons to forgo actual drum wrap is mostly due to lack of funding. For a kit of the tiny variety, commercially available wrap shows up on the viability radar simply because the quantity required, and thus the cost, is smaller. As we compared offerings based on cost, reviews and design options, Bum Wrap’s selection of Digital designs rapidly climbed to the top of the short-list. Why Bum Wrap? Two reasons. Although we already admitted to being cheap another reason we usually skip wraps is that they tend to be rather “generic”. You know the feeling of browsing through designs and seeing the same familiar patterns repeated over and over? 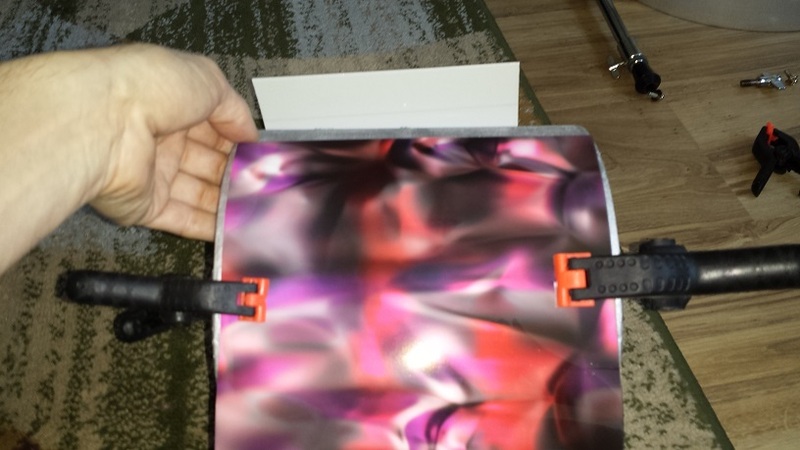 Bum Wrap’s selection is refreshingly different with some highly unique designs, as well as the ability to custom make a wrap from your own digital file. The second reason is indeed cost. Bum Wraps pricing is among the most aggressive of any we compared. 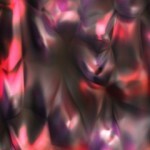 After much picking and choosing we eventually settled for a design entitled “Red Abalone”. For such a small kit we wanted something that really stood out. Although we had some five or so patterns that would have all been great choices, my daughter eventually cast the vote that tipped the scales in the favour of said Red Abalone. Her predisposition to pinks and purples no doubt playing a large part in the choice. Our wrap came neatly rolled up in a six by six inch box the length of the deepest drum. (13″ in our case.) Eagerly I cut the tape, opened the box and tore the plastic bag containing the wrap rolls open. Unrolling the wraps for a first look certainly didn’t disappoint. The design and colours are every bit as bright and “in your face” as the website’s images suggest, if not more. The gloss, lustre and depth exceeded my expectations. At 21 mil, just a tad thinner than most regular wraps, I hadn’t expected the deep glossiness to compare. Quite contrary it’s every bit as deeply lustrous and gleaming as any wrap I’ve ever observed. A nifty advantage of Bum Wrap is the way they pre-cut the wrap to the precise drum sizes ordered. None of the tedious ordering of full “sheets”, + whatever fractions of “sheets”. 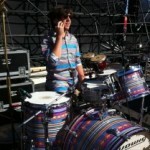 Not to mention bridging the gap on a larger bass drum where a full “sheet” won’t reach around. With Bum Wrap, you simply state the drum shell’s diameter and depth and whether you want the standard 1/4″ cut back or not. Our wraps arrived precisely cut to depth and with about two inches overlap with a pre-applied adhesive strip on the inside. The recommended installation method doesn’t involve adhesive. (Other than the pre-applied adhesive strip.) Thus wrapping a drum shell with Bum Wrap is easier than wrapping a Christmas gift. Sounds like a joke, but honestly, I achieved perfect results with my first drum wrapped with Bum Wrap. After years of practising I have yet to master the art of gift wrapping. Detailed video instructions can be found here, with some additional comments in the FAQ. Wrapping the DIY Micro Drum Kit, we tried both the recommended method and going a bit more traditional route and glueing the entire wrap as an additional ply. The recommended method is super-simple and just about fool-proof. However, even if one somehow managed to fail, Bum Wrap will send out a replacement for just the cost of S&H. There are two ways to glue wrap to the shell. The most common is to use contact cement or spray adhesive. This method works great but leaves little room for error as it’s an instant, irreversible bond. Lining up perfectly straight is crucial. 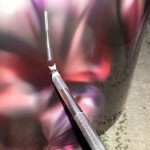 I tend to use regular “non-instant” glue which is just about as fool-proof as just securing with the pre-applied strip. This method allows for re-positioning and the existing strip greatly aids in securing it in place while curing. This wrap is a tad thinner and a fair bit softer than most. 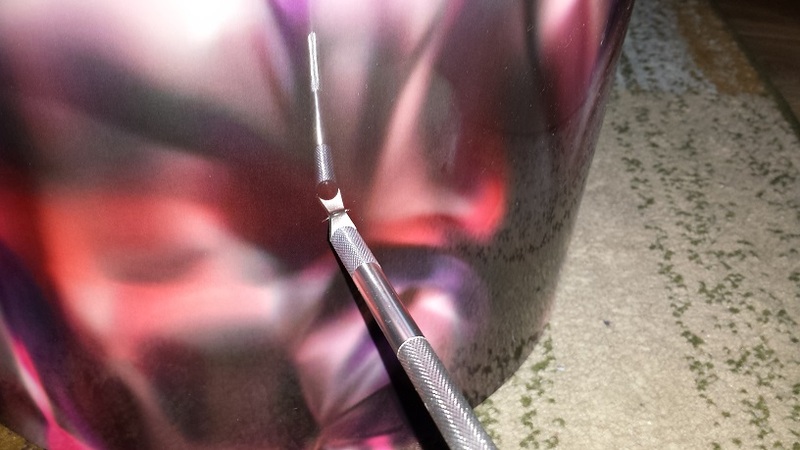 Bum Wrap recommends using a Philips-head screwdriver to punch the holes, or an Exacto-knife to cut them out, I found drilling to work just as well. 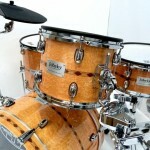 Drum Wrap’s selection is virtually limitless since you can order them in your own custom design as well as choices of truly unique patterns and even wood grains. The only limit is that there are no sparkles or glitters. Since we only just finished installing this wrap we won’t rate for durability at this time. In about six months this page will be updated with a durability rating. Pricing: Bum Wrap simply prices their wrap based on drum shell size. There are no various price groups. All wrap designs are the same price. As a sample, Precut wrap for a 12″ Diameter X 8″ deep shell comes to US$22.99. Material: A layer of printed paper sandwiched between plastic plies. 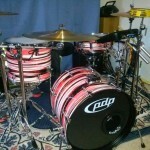 “Affordable drum wraps for any drummer. 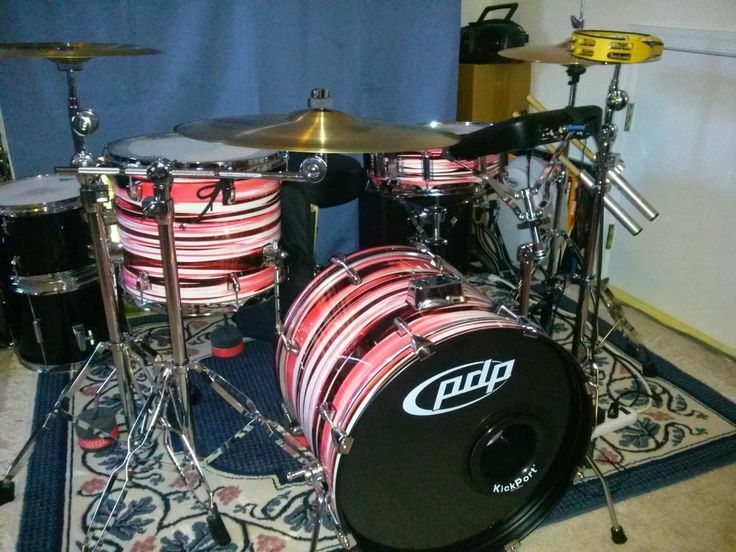 Try and find this quality drum wraps cheaper . . . we challenge you. 100% money back guarantee. We have the most affordable prices and sharpest designs in the industry. I encourage you to look at our reviews. 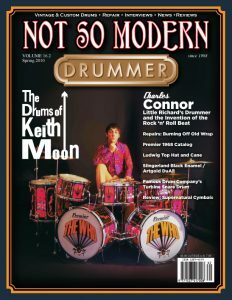 Because after all if you’re spending your hard earned money on your drum set, then you want a quality product that will stand up for many years of touring, local gigging or just jamming by yourself. Right? WE SHIP TO EVERY COUNTRY ON THE GLOBE !!!! What are you purchasing from us? High heat laminated drum wraps 21mil in thickness cut to YOUR specific sizes using any design on this site or something custom you send us. These wraps are extremely easy to install, use no glues and can protect your original finish. 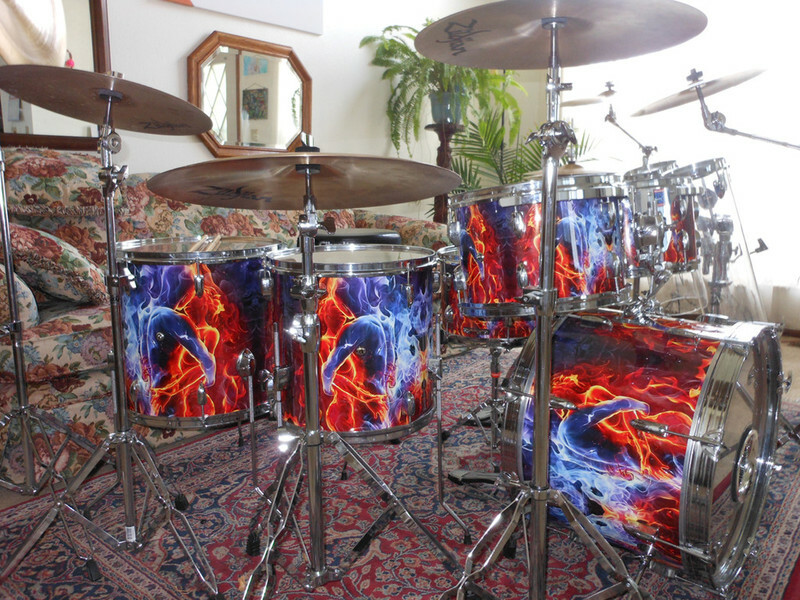 All drum wraps are one entire piece, not two like most wrap companies. 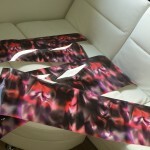 They can be installed on raw shells or over your existing wrap. We use UV ink so they will not fade or bubble in high heat conditions.They do not alter the drums sound. They can be removed and no residue ever touches the original finish. They act as a protector of your original finish. Email us with a custom design (we do not upcharge for custom designs like the “OTHER” wrap companies do). We will return your email and start your order. All transactions are done securely through PAY PAL or credit card. We can get most orders out the door to you in 7-10 days sometimes sooner. ALL orders are GUARANTEED or your money back. 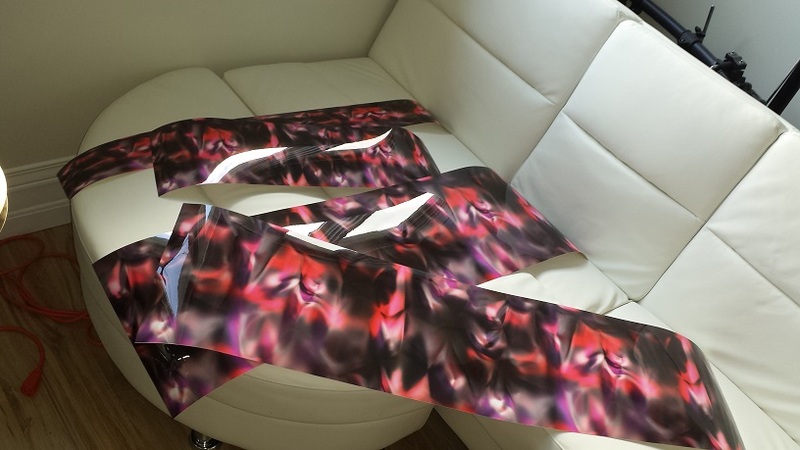 If you happen to make a mistake on a piece during the install, simply send it back for replacement wrap for just the cost of shipping and handling. 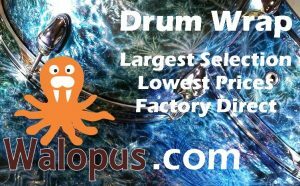 We currently make wraps for Canopus Drums, Jobeky electronic drums in the UK, A & S drums ,Georgia Phil Custom Drums, Hacksaw Custom Drums, North Custom Drums, RTC Customs ,Kyle King Killer snares, Edge Tone, and Diamond Kut drums. Many more suppliers in the works . 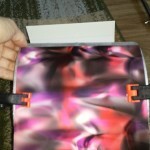 Our first Drum Wrap Review. 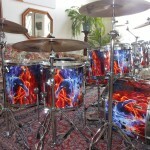 Bum Wrap's Digital Drum Wrap, examined, tested and evaluated for Quality, Finish, Value, Ease of Install and Wow-factor.